Graphene is one of the most promising materials for advanced electronics due to its extraordinary chemical and physical properties. The interaction between the graphene lattice and light opens the way for the development of novel devices with superior functionality. Nevertheless, technology used for traditional silicon electronics is unlikely suitable for graphene. Photolithography is the main process in semiconductor production, using polymers and liquids that can drastically alter the initial properties of graphene. The novel maskless methods are in active development in graphene technology. 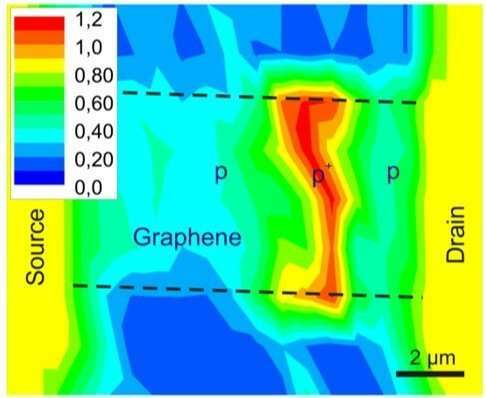 An international team of researchers from National Research University of Electronic Technology (Russia), Forschungszentrum Jülich (Germany) and AIMEN Technological center (Spain) has developed a direct writing method of graphene modification. The authors utilize the ultrafast laser functionalization of single-layer CVD graphene for maskless fabrication of micro- and nanoscale devices. The authors suggest that the femtosecond laser provide photo-chemical reaction (reaction initiated under light exposure only) in the area of laser sport on graphene leading to its modification by oxidative groups. These groups drastically modify the electrical and optical properties of graphene providing functional in-plane device development without using any complicated mask-based technology. 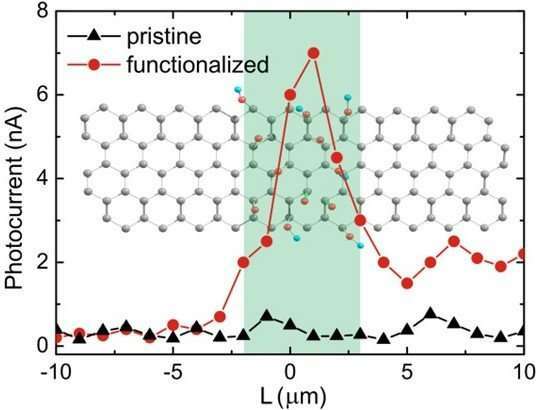 The authors produced p-p+ junctions in graphene field effect transistors via fs-laser pulses. The fabricated photodetectors work at room temperature and do not need the external cooling. The highest photoresponsivity of 100 mA/W was observed in modified structures. This study provides a first step in progress of fully maskless methods for processing of novel nanomaterials. Changing the environment during fs-laser treatment may lead to a different functionalization of graphene surface. Additionally, other 2-D materials like phosphorene provide very good photochemical activity and can be processed the same way. The study shows that the fully integrated photodetector with high responsibility, low noise, and high linear dynamic range is feasible by maskless patterning on graphene surfaces through ultrafast laser processing. The researchers discuss their technology further in ACS Photonics, an American Chemical Society publication.